So it looks as if WES7 really needs the winvblock parameter in grub4dos. Congrats on boxing WES7 with the WinVBlock pack! where the volume drive letter is given for reference only, as its dynamically reassigned depending on whether the volume is online or offline, but the original letter is stored in Registry, and changing it offline will point to a different partition. The letter isn't used at boot time anyway, as Virtual Disk Signature & Partition Offset are used by Bootmgr instead. In your efforts you 1st repaired boot sectors (which may be hard to do correctly for offline VHDs with Bootsect command), then updated BCD to match these bootsectors data, so the VHD finally booted (almost ) after using the right WinVBlock version. The dummy parameter disk may indeed be needed for some Windows & WinVBlock combos. But I'd avoid using WinVBlock for OS natively supported for boot from VHD, since WinVBlock disk appears at times half-functional in the tested here OSs after boot (try to open Device Manager or such), possibly due to some NTFS permissions & UAC issues that need further investigation by Sha0. I amended How to Repair VHD BCD Store post with the suggested repair sequence. on that list is also iscsi booting (with ms iscsi target or any other iscsi target). Did you have any progress with these 2 research targets? Small WES7 VHD would be an ideal tool to service on-the-run after loading to RAM the main OS volume on the only HD in a student or salesman laptop or netbook, if it doesn't boot anymore or needs reformatting etc. Installing OS and booting VHD collections via iSCSI may be quite attractive for university & enterprise & small business activities. People of all kind of backgrounds are visiting this forum, including MS developers. In fact, I also wanted to suggest yet another test: add Boot.wim and Install.wim to VHD, and install OS from it to a HD or USB Thumb instead of Win Setup ISO. Or, possible technique may include copying a ThinPC VHD, sys-prepping the VHD copy, adding Boot.wim to it, booting the VHD and installing ThinPC from it to a HD. Developing these techniques would contribute to gradually replacing WinPE with a small VHD for typical usage (service & OS install) scenarios. i used a disk less laptop (lenovo t60) and starwind 5.0 using my existing vhd images. but i "played" a lot with my images (tweaking for native vhd, tweaking for usb boot, tweaking for winvblock) and i am not too sure it can take any extra feature like iscsi. i need to redo a fresh image. therefore i am going to do a fresh installation this time straight from iscsi. next will be the boot into ram. site note about the offline installation : i may lack knoweldge there but it seems wes7 cannot be installed the "imagex" way. my lenovo t60 diskless freezes during windows setup (both wes7 and thincpc). could be that my hardware is faulty (although it booted my vhd's from usb disk earlier this week). therefore, i tried from a diskless virtual machine (virtualpc), this time wes7 reaches the screen where i need to select a disk, sees my iscsi disk but refuses to install there. same setup with thinpc : thincpc reaches the "select disk" screen but does not see my iscsi disk. i have run this method (http://labalec.fr/erwan/?page_id=113) several times with windows 7 and windows 2008 with success so i wonder if wes7 / thinpc are ok with iscsi. either that or there is a flaw in my setup (network, etc). Are you using ThinPC ISO to install it to an iSCSI disk? Check in Regedit, if iSCSI drivers are set to start at boot in its WinPE (Boot.wim). Pre-format iSCSI disk with Diskpart before attempting the install. Also, sfinktax posted success in another iSCSI thread about installing OS to VHD and running it from VHD over iSCSI, with some tips. i'll prepare my vhd disk indeed before to rule out issues there. i'll also check iscsi drivers (start=0) in thinpc setup files. I have mounted my iscsi image under windows, formatted it to ntfs and made the partition active. But now gpxe boots on that disk and stops with "bootmgr missing" which is indeed what should happen. I can no longer use the following trick to install to iscsi : use gpxe to "try" to boot on my iscsi disk and then hand over the dvd boot. I'll see if I can manually go my way thru the command line of gpxe. edit : ok i managed to go beyond the "select disk" in the wes7 setup and files are now being copied to my iscsi disk. Trick was to present a raw disk to gpxe and later to wes7 setup, then go to wes7 setup console mode (shift+f10) and prepare the disk myself with diskpart (create partition, active, format ntfs). Wierd as I dont recall having to do that with other windows 7 editions. side note : starwind 5.0 can use existing fixed VHD disks as raw image. just append .img to you VHD file name. And also one can easily turned a raw image (used by starwind 5.0) into a fixed vhd disk. See how to post above. we could get rid of the dhcp/tftp with a gpxe kernel + grub4dos media like usb, floppy, cd, etc. Great progress! It looks Win Setup.exe incorporates some checks on allowable media to format for OS install purposes (marketing limitations). Could you explain it in more detail or give a link? I think that simply applying Install.wim with ImageX to an empty VHD via iSCSI may be a faster way o install WES7 & ThinPC? And then specialize the OS on VHD during 1st reboot via iSCSI - possible? Since iSCSI supports VHD disks, I wonder if set to start at boot time, can it pickup the VHD mapped by G4D or Bootmgr? It would allow to use it instead of WinVBlock in unsupported for native boot Win7 & WinXP versions. I could apply install.wim to a vhd (no need to use iscsi at this stage). Then set it as iscsi target. At this stage the vhd is still generic (aka not specialized). Then i should be able to boot it thru iscsi (or any other boot method actually). This scenario could/should work for any windows 7 version, with iscsi as boot method. Is this the idea you have in mind? Edit : i understood what you meant. Using the iscsi initiator in place of winvblock is a long shot. You would need somehow a network and a iscsi target. Regarding iscsi boot without dhcp/tftp, one can make a floppy image with gpxe pointing to the iscsi target. This way you no longer need the dhcp server to fill in the root path (aka the iscsi target). Yes, using ImageX & iSCSI would simplify remote OS install without using complex enterprise deployment schemes. Can network be setup on the same PC (local host) to allow using iSCSI driver instead of WinVBlock for local VHD boot? Iscsi initiator and winvblock are similar in a way that they both map a drive for windows. Even more similar that in both cases the file used is the same (a raw img or a fixed vhd). But technically speaking i see quite a difference since today the iscsi iniatiator (client) talks thru ip to a iscsi target (server). The iniatiator would need to be fooled/tweaked/hacked to behave like winvblock. Maybe pointing to the localhost plus another driver around acting as the target? Can 127.0.0.1 be used as "remote" IP address? under windows, yes : i can use 127.0.0.1 to connect via my ms iscsi initiator to my iscsi target. Would that allow to boot unsupported for native boot OS from VHD via iSCSI by using iSCSI driver instead of WinVBlock on the same PC? Did you try that - what happen? How could we have one physical machine act both as the iscsi initiatior and target as the same time? You need a fully running operating system (windows or linux) to run a iscsi target. While booting, the only way your iscsi initiator connects to a iscsi target is to that one run on another running (aka already booted) windows. Until / unless we eventually find some tweak/hack, I cannot perform such test. Or did I mis understood you? 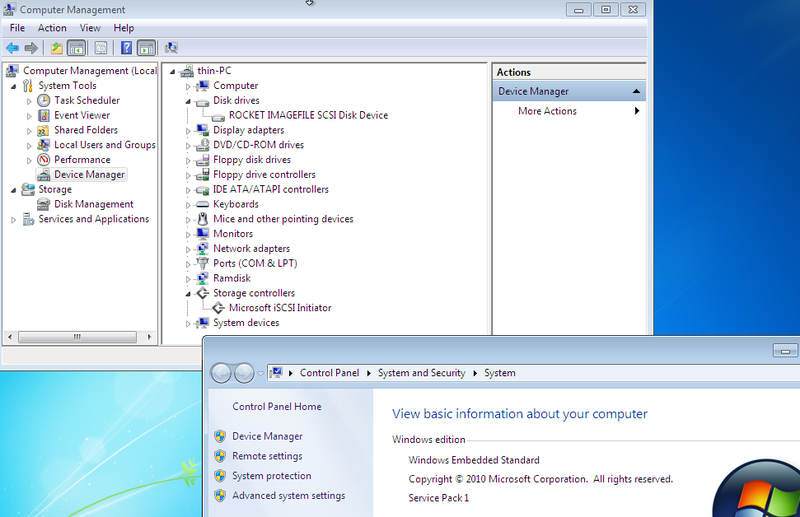 A good example would be a VM running on Win7 PC - they manage to network very good, including sharing data. Many processes and apps on the same PC talk to each other via network (local host). So the first test would probably be along these lines, unless there are obstacles... Say, a VHD file is placed on HD not hooked directly, but accessible via local network to VPC - can we boot that file inside VPC via iSCSI? Not sure, why hibernation isn't officially supported in native boot VHDs, but the reason is probably caused by licensing issues - to make it still attractive install OS on one's HD rather than take it with you on a Thumb. Interesting, MS started using hardcoded restrictions, since Registry fixes quickly become common knowledge. Any news on testing iSCSI non-native VHD Boot on a local PC? It seems sfinktax also slown down his presence after being kindly asked to offer a VHD Director alpha version that can do at least something useful (a single working function) instead of keeping to draw ideas and endlessly advertise future (commercial?) product over merely GUI pictures. Was abroad most of the week and could not give it a go. Would you mind drawing some kind of design layout / schema to help me understand how you see this test? Must say I have a hard time to catch it. Start a VMWare or VPC VM with bridged network connection (separate IP). Place a ThinPC VHD file on a HD on the same PC, which is not hooked directly to the VM, but accessible from it as network drive. Can we boot that VHD inside the VM via iSCSI? I seem to have hit another snag. After i finally managed to boot from a vhd, the install proved insufficient for my needs. To save time, i wanted now to install a new WinEmbedded directly into the VHD, without going the VirtualPC way. For places to install to, i get only the HDD partition offered. the VHD don't show up. May I suggest you to follow Create Native Boot VHDs Tutorial listed below? If you have Install.wim in your Setup source, why not apply it with ImageX to a formatted attached VHD, and then use Bcdboot cmd - takes 3-5 min? Or create and format the VHD from Win Setup PE and add MBR & PBR to it with Bootsect cmd to install OS on it legacy way.